The Home Alone DVD Box Set includes all 4 movies starring Macaulay Culkin. Eight-year-old Kevin McCallister has become the man of the house, overnight! Accidentally left behind when his family rushes off on a Christmas vacation, Kevin gets busy decorating the house for the holidays. but he's not decking the halls wiht tinsel and holly. Two bumbling burglars are trying to break in, and Kevin's rigging a bewildering battery of booby traps to welcome them! The McAllister family go on a holiday to Florida. Kevin gets separated from his family and manages to get himself onto a plane to New York instead. There, he checks into the best hotel with his father's credit card and sets out to enjoy himself. Unfortunately, the burglars he foiled before are in New York after being released from jail. International crooks hide a top-secret computer chip inside a toy car, but an airport mix-up lands it in the hands of eight-year-old wiz-kid Alex Pruitt, who's home alone with the chicken pox. Madness and mayhem kick into high gear as the pint-sized hero defends his house against the bumbling bad guys, armed with an outrageous array of ambushes and booby traps. It's tough being nine. Tougher still is spending Christmas with dad at his new girlfriend Natalie's mansion - even though it's loaded with all the techno-gadgets any kid could hope for. But this Christmas, Kevin is really in hot water again, and so are Marv and his sidekick, who are trying to rob Natalie's house! In this hilarious holiday tale for all ages, 10-year-old Finn Baxter (Christian Martyn) thinks his family’s new home in Maine is haunted – but the truth might be even scarier! A trio of thieves (led by Malcolm McDowell) is after a priceless painting hidden in a secret room by the previous owner. So when Finn and his sister (Jodelle Ferland) find themselves home alone, Finn rigs up an elaborate array of techno-gadgets and booby traps to protect his pad from the bumbling criminals trying to break in. It’s a delightful comedy caper that will steal your heart again and again! 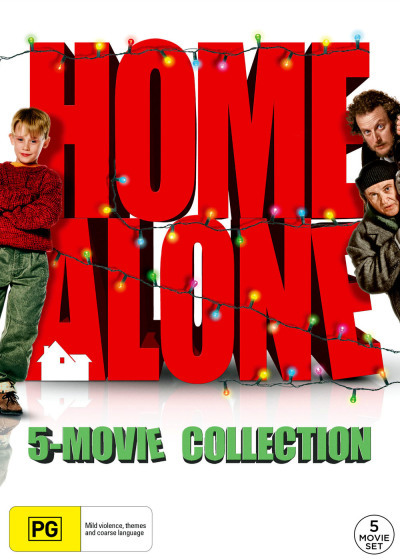 Click the button below to add the HOME ALONE COLLECTION to your wish list.